Banquet tables, also known as feasting tables are huge in wedding design (no pun intended). But even if you’re not tying the knot, the appeal is just as magnetizing at home as in the banquet hall. Especially for avid entertainers or would-be hosts who just haven’t hit on the right seating arrangement to comfortably accommodate all the invitations they’d like to extend, an extra-long table is an obvious solution that can drastically simplify the setup and flow of your dinner parties. No more chair rentals, no more wobbly folding contraptions, or mismatched tables from every corner of the house: There is a better way, and your fellow Houzzers who have stretched their seating are here to light the path. 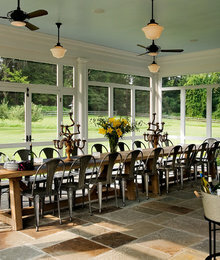 If you do a lot of entertaining, a setup like this is a double-whammy: An enormous feasting table positioned to overlook outdoor living space with easy access means your party can float seamlessly between an outdoor cocktail hour and indoor mealtime. Even in the winter, your guests can dine to the view of falling snow. 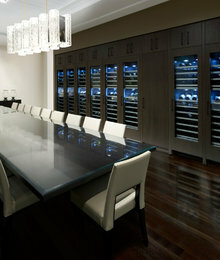 A long table is also a fine opportunity to make a grand statement with oversized lighting. Slick and contemporary, the leather chairs and polished tabletop here reflect the light of a stellar crystal fixture that hovers over the table like a centerpiece. Illuminating the dining table is all about proportion, so stick to a diameter or width that is no more than 2/3 the width of your table. 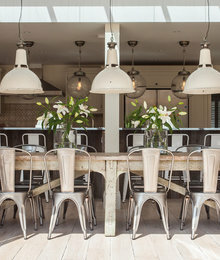 You can opt for either a single long chandelier or multiple small pendants for a more subdued look. Just make sure the wattage totals between 200-400 for a well-lit room. There’s no doubt a long table chews up a lot of floor space and ultimately defines (read: dominates) the space. Invest in a striking custom table and embrace the way it sits in your open floor plan like a king on a throne, or push two tables together if you’d rather maintain a little more flexibility. Two long tables will allow you to separate them to accommodate two additional people if the need arises. Just because you have a large table doesn’t mean you have to populate it with the customary number of chairs. A 6-foot table comfortably seats 6, an 8-foot table 8, and a 10-foot table between 10 and 12 in a pinch. But if you don’t regularly seat that many any purchased a larger table mostly for the jam-packed holidays, stick with the chairs your family uses daily and keep the rest stored away. In an already minimalist room, the seating capacity will look intentional, though if you tend toward the maximalist end of the spectrum, approach with care or risk your well-reasoned deduction of chairs looking cheap or accidental. 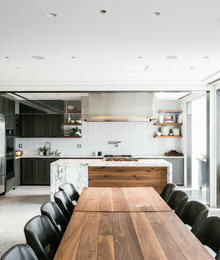 It’s funny how context determines our perception of cost: An oversized 12-foot dining table that feels like an expensive extravagance for the dining room suddenly seems like a bargain in comparison to the cost of constructing a similar-sized kitchen island that many of us wouldn’t dream of crossing off our remodel wish lists. If you’ve got a long kitchen that allows for a three-foot circulation perimeter around the table, you might just save yourself thousands by opting for a banquette table instead of the marble waterfall island you’ve been eyeing. 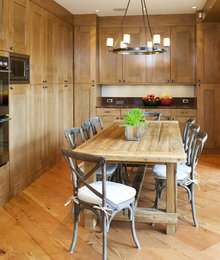 If you already have a long kitchen island but want a more formal seating arrangement, too, mirror the island’s layout. It is easy to track down custom table-makers, or carpenters, cabinetmakers, or even upholsterers who also build furniture who will all gladly do the job for you, and you can feel good about supporting local workrooms. You name the dimensions, base style, and even materials, and have something made exactly to your specifications. 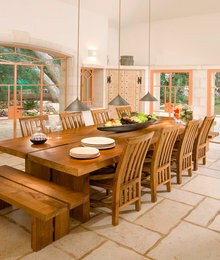 Similarly, a long feasting table is a nice complement to a long kitchen island devoid of seating. The counter space can be freed up for a buffet and family-style serving, keeping the table clear for decor or, simply, for eating without the usual clutter and chaos of shuffling bowls and dishes around the table. With a little extra forethought and planning, a kitchen island can even be made to double as a banquet table in its own right. This one has all the right proportions and just enough chairs to do the job. There exists indeed a rich precedent for roomy farmhouse tables in rural Europe and America, where household size was almost always larger on average than in the cities, at least up until 1980. We see these farm tables in the work of Van Gogh’s contemporary, Jozef Israels, and by Gaindomenico Tiepolo before him. Though household size has decreased steadily over the years, a farmhouse table is still an enduring symbol of a simpler time– and, may I add, a great excuse to add some serious host and hostess chairs to either end. The trouble with dining chairs is that they only fit one person; you’ve got to choose at the outset how many people you intend to seat at your party. If you find that limiting, you might just love how an upholstered nook that spans the length of a wall allows you to more flexibly seat a crowd. 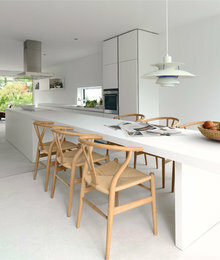 Even with only four or five seated, the empty bench space will blend into the rest of the room in a way that multiple unused chairs just don’t. Much like an upholstered banquette, benches don’t limit you to a fixed number of guests that can be seated at the table: Fewer guests means more room for everybody to spread out, while more guests will be packed closer together for an intimate experience. 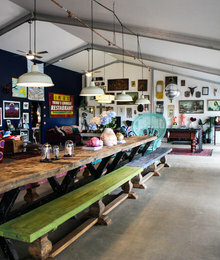 Communal tables like these are even growing popular in restaurants and bars. There’s something about them that seems to call out for family-style serving in large platters, too. If you do most of your entertaining outdoors, you might keep only a breakfast table and island seating in your kitchen and put a feasting table outside. Invest in a high-quality teak product for longevity, and protect your guests and your furniture from the sun’s glare by placing it under an overhang. 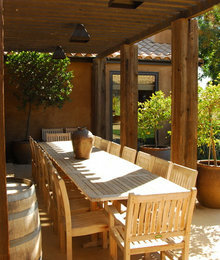 Or make like the folks in wine country do, and set a rustic feasting table under a tree for al fresco dining a la Sonoma County. At a wide enough table, you can even fit two people on either end (kids maybe?) by using a bench, settee, or chair and a half. 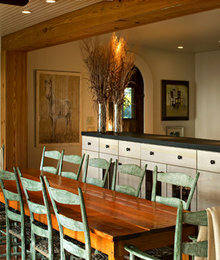 Just be sure you’ve chosen a table, like a trestle or open-leg style, that can comfortably fit diners on the ends.